Senior Vice President and Chief Financial Officer, Alphabet and Google, Inc.
PORAT: So I’d like to welcome everyone to today’s last session of the Council on Foreign Relations Stephen C. Freidheim Symposium on Global Economics. We have a panel here today that clearly needs no introduction with Chairman Bernanke, Secretary Paulson and Secretary Geithner. And I’m Ruth Porat, the chief financial officer of Alphabet and Google. So the goal of our discussion here today is really to cover the arc of the crisis. What we want to do is talk about the choices made to address the biggest problems they confronted, to assess their choices, and then to look at the risks and the tools that are available today. And this rock-star trio presided over a time when there were no good options. As we discussed back at the time, they were consistently choosing between least-worst options. And I firmly believe that the United States and the world economies would have been in a much worse place without their leadership and the decisions that they made. But now here we are ten years later on the reunion tour. (Laughter.) And so they are asked—and you do get to consider—what if they had done something else, and what do they regret? We’re going to focus on that and also the lessons so that their successors can do as much as possible to both prevent the next crisis and get us through it as effectively as possible. Presiders typically now go through bios. But instead, I suggest that once we’re done, in the improbable event that members still need to check the bios, please go to Google, click away. (Laughter.) And we’re then going to leave time for questions. So I want to start with a rapid-fire question for the three of you, kind of an obvious one. What was the most terrifying moment of the crisis and why? So why don’t we just go right down the row here. PAULSON: Well, there were—there were plenty of terrifying moments for me, but I’ll focus today on, you know, when—the moment I learned that the House was voting down the TARP the first time because it is—and there was sort of a mix of devastation and terror. But to go to Congress and to say that the administration is powerless to prevent a financial meltdown and avoid an economic catastrophe unless you act, you know, you are—you know, that’s an untenable position to be in and it’s a difficult position to be in. And when they voted it down, you know, you’re exposing your vulnerability to the whole world. So immediately we scrambled. And we were too busy to be—to be terrified, but I still remember that night waking up in the middle of the night and saying, wow, you know, if we don’t get what we need from Congress, how are we ever going to put this thing together? And that’s when I was looking at food lines and massive unemployment and so on. PORAT: We’ll come back to that. Tim, your worst moment. PORAT: A lot of choices there. I think the hardest thing were in those weeks—those weeks I would say B.C., before capital—before TARP—when I think we were—we thought that things, like, at that point gone way beyond the strength of the tools we had to address at that point. You know, the Fed at that point was, like, way beyond the traditional frontiers of the use of the lender of last resort authority. It was not working. It was not enough. And that was scary. And then, you know, when the—you know, President Obama was—you know, started getting ready to take office, at that point, you know, we were looking at an economy that was still, you know, falling off the cliff, shrinking annual rate of about, you know, eight percent of GDP in real terms. And there was this deep perception then, despite all the force of the actions that had been put in place in the fall, you know—despite, you know, backstopping trillions and trillions of dollars of liabilities in the financial system in the U.S. and globally, all the capital injections—you know, there was this deep conviction in early January that the system was insolvent and would need another, you know, trillion or more of capital. And trying to decide then what would work, what might be enough, what mix of things would solve it, that was hard too. PORAT: And, Ben, your biggest nightmare moment? At the end of this discussion, though, Harry Reid, who was the majority leader at that time, looked at Hank and me and he said—he said, Mr. Chairman, Mr. Secretary, he said, I want to thank you for coming over here and explaining this to us. It’s been very helpful. He said, but I want you to understand one thing: nothing you’ve heard here tonight constitutes congressional approval for what you’re about to do. This is your call and your responsibility. So, like Hank, you know, it was pretty evident early on that the political support for this was not going to be particularly overwhelming, and it was a very lonely—a very lonely feeling. PORAT: All right. Let’s dive into a couple of the events. Let’s start with you, Hank, with Fannie and Freddie, so I remember back in those days staring at a $5 trillion balance sheet and you were laser-focused on the risk to the economy from the fragility of the two housing entities. And you frequently said that you believe conservatorship of Fannie and Freddie not only averted a disaster, but did more to mitigate the reduction in housing prices and the number of foreclosures, and therefore helped people across the country, than any other event. And I think that’s not well understood. So can you help us better understand why you believe so firmly it helped homeowners? PAULSON: Ruth, first of all, thank you. And, you know, as you said, you know, this was a—huge entities. And if they had imploded, you know, it would have been economic Armageddon, and it was really important to stabilize them before Lehman went down. But to get to your question, the way I think about it is this. The bursting of the housing bubble was really the match that lit the fuse here that started the crisis and led to big, you know, reductions in prices of housing, which was devastating to many Americans. And that was a big cause of foreclosure. Now, before we nationalized Fannie and Freddie and put the credit of the United States government behind them, they were insuring about half of all mortgages, maybe a little bit less than that. And—but after we did that, they were, for all practical purposes, the only source of mortgage funding during the crisis. So I can’t prove a counterfactual. But just imagine, without mortgage funding, how much farther down housing prices would have dropped and how many more foreclosures there might have been. So again, I think this was important in two ways. It was essential to stabilize the financial system, but it also, I think, made a big impact in terms of dampening what was a very bad situation but could have been worse. PORAT: All right, talking about much worse, let’s go to Lehman. Tim, so, you know, there was a lot of discussion around Lehman weekend about moral hazard. It felt like any corner you turned in New York, you heard moral-hazard concerns. And there was this notion that the government needed to draw a line somewhere so that others didn’t feel like, you know, heads I win, tails you’re there. But after the carnage from Lehman, the debate began. Was failure of Lehman a choice the three of you made, or was it, as you’ve each explained, the result of the fact that you didn’t have legal authority? And I think the understanding around this was complicated by the fact that Lehman bankruptcy was September 15th, and just a short week later Goldman Sachs and Morgan Stanley became bank holding companies. GEITHNER: AIG was the next day. PORAT: AIG was—yes, AIG was right after that. PORAT: We’re going to get to AIG, so don’t worry about that one. PORAT: But I’m sticking with the bank-holding-company theme rather than going on to insurers, which we will get to. So what changed? Why not Lehman? Why Morgan Stanley and Goldman Sachs? GEITHNER: You can go back to March, because it’s important to think back to that moment when Bear Stearns was at the edge of the cliff. And we were trying to figure out, could the system withstand the failure of Bear Stearns at that moment, or did we have the means to offset that damage by lending more freely to the investment-bank community? And we made a judgment then, which I think was the right judgment, that failure would be terribly damaging and that we should try to figure out how to prevent it. But we also decided that, in the case of a weak failing investment bank like Bear Stearns, that our only option was to try to find a willing buyer large enough to effectively guarantee the obligation of that firm to prevent default. And in that context, we were able to find a willing buyer and find a—and we were able to, you know, induce and assist that by taking some of the risk off the balance sheet using the Fed’s ability to lend against collateral. We had the same presumption going into that weekend. You know, that weekend Merrill Lynch and Lehman and AIG were all at the edge of the cliff. And we worked very hard to try to prevent the failure of all three of them. In the Merrill case, we were successful in finding a willing buyer. In the Lehman case, we weren’t. Why was that? That was because Lehman was perceived to be much weaker and was much larger, more complicated than Bear. And the system was much more fragile. So the universe of willing buyers was very limited then. And in the end we had one potential buyer, and that buyer, Barclays, the British wouldn’t let them go ahead. They thought Barclays was effectively too weak to absorb the risks. So that left us with no option to lend in that context. That was our basic judgment. We thought it would be bad. It was worse than we thought. But we were pretty sure it would be bad because the system was so fragile; bad enough worth trying to avert it, but not something in the end we had the ability to do. You’re right that—I don’t know how—you said a week later or two weeks later. We figured out a way to buy a little more time with Goldman and Morgan Stanley. Goldman and Morgan Stanley that weekend were able to go raise a pretty substantial amount of private capital, something Lehman had tried all summer to do and failed to do. They were able to raise some strategic capital, a pretty substantial scale. And in that context we were comfortable making them bank-holding companies. But the bank-holding companies as a nation didn’t buy them additional borrowing authority from the Fed. It created a little bit of pixie dust, halo effect, but that was fleeting. And it’s worth remembering the time that bought was very limited, and conditions around both of them eroded; again, a symptom of how bad the underlying—you know, the underlying storm was. PORAT: All right, so on to the third nightmare, AIG. Moral hazard clearly on your mind with respect to AIG. You’ve said that you were reluctant to lend to AIG because you didn’t want every nonbank to think it had a backstop, so moving, you know, out of the pure banks. BERNANKE: Yeah, well, were looking—we weren’t focusing on the investment banks. And AIG was a little bit at least under my radar, you know, in the summer, although we had staff watching it and paying attention to it. And when the first possibility came up, you know, they were—they were talking about acquisition, you know, various kinds of deals. When the possibility came up that we might lend to them, my first reaction was, oh, my God, this is really extending—you know, the Fed is supposed to lend to commercial banks. We had already extended this to investment banks, so this would be yet another step to insurance companies. And my initial reaction was this is something we shouldn’t do unless absolutely necessary. But then I fairly quickly, you know, over the same weekend that I was on the phone—and it was a tough weekend. I was, you know, talking to Tim and Hank about Lehman and trying to prepare for the FOMC meeting on Tuesday, and there was a lot going on, and then AIG. But as we got more information about it, I mean, it seemed to be a pretty clear call that we needed to do something on two dimensions. First was AIG, as I described it once, was a hedge fund on top of an insurance company. So it was like a mini investment bank that was insuring the credit of a lot of major financial institutions around the world. It had a very, very long position on RMBS, basically, both through securities lending and through its insurance of other firms. So its failure would have immediately created uncertainty about a lot of other firms, it would have created a lot of fire sales, it would have created just an enormous amount of stress, probably equivalent to another Lehman just from that dimension. Then on top of that, it was, of course, the world’s largest insurance company. And so we had the possibility that this whole thing was going to leak into a whole new dimension. For example, if insurance companies fail, there’s complicated state-level arrangements whereby other insurance companies have to make good, and so that would actually raise concerns about existing policies, about other insurance companies. It was just—it was horrible to contemplate, frankly. The reason we were able to act there—and I want to reiterate what Tim said, which is that it was a question of viability and feasibility. The reason that AIG was a feasible project for us was that even though there was no way—if the—if the hedge fund on top of the financial products division had been by itself, we would have been sunk. But it had, you know, all these insurance subsidiaries which were global and were profitable, and they could stand as collateral for a loan to address the liquidity problem. So we did have a means to do that. And that’s, you know—even so, I have to say that people say we didn’t put tough terms on the recipients. Tim really nailed them pretty hard, you know, with eighty percent equity ownership and a whole bunch of other—eleven percent interest rate and all kinds of very tough conditions. And I was actually pretty concerned that they would, you know, just say, well, we’d just rather go with default because it was such a tough situation. But they did accept and we were able to—you know, it took a lot more effort, you know, many rounds to keep the company stable. It was the biggest headache we had, I think, during the crisis. But we did have the means to stabilize it because we had the collateral against which the Fed can make a—make a loan. PORAT: And so the list of horribles continues. Let’s go to TARP where you started. So the TARP bank capital program put capital into over seven hundred banks. The money all came back with actually a nice profit for the U.S. government and did prevent the collapse of the system. Why was this so successful and so terribly unpopular at the same time? What were people missing? PAULSON: OK, Ruth, I’m going to answer that, but I should have—when you mentioned Fannie or Freddie, I wanted to say something, because I remember when we were in the depth of dealing with that, calling John Mack, who was the CEO of Morgan Stanley, and asking for two of the very best advisers possible, and we weren’t able to pay a fee or indemnify, and we got Ruth and Bob Scully. And boy, did they make a difference. PORAT: I think we got a dollar. PAULSON: You may have got a dollar. It was indemnification. PORAT: Yeah, that was a problem. PAULSON: I mean, no one else was going to step up without indemnification. And boy, did you all come through. PAULSON: You’re right. So, you know, TARP, you know, the money came back with a profit. But the important thing was we were able to get out and stabilize, recapitalize the financial system with lightning speed, put money into seven hundred banks and avoid a meltdown. But it’s clear why it was so unpopular, because we did not have more compensation restrictions, and putting capital into banks or into any private enterprise, taxpayer money, is a red line in the United States of America. Doing that is very unpopular. You know, we were perceived as, you know, helping the arsonists. Now, why did we not place compensation restrictions? I think that’s really important. We were doing something that had never before been done. We wanted to induce many, many banks, even healthy banks, to take capital because the system was so fragile the crisis could spread very quickly from weaker banks—relatively weaker banks to relatively stronger banks, and we didn’t want that to happen. And we had no ability to force banks to take capital. On top of that, during a crisis no bank wants to raise their hand and say, hey, I volunteer to take capital, because they’ll be toast. That’s a sign of vulnerability. There’s a big stigma to that. And we knew we were going to put restrictions on CEO compensation. So if we’d gone a step further and said we want to control your overall compensation, that would smack of nationalism. The program wouldn’t have worked. So what happened was we went out with lightning speed, we did something that was very nontraditional, and it worked. The Europeans went the traditional route. You know, they were—they treated their banks like we treated Fannie or Freddie or AIG, and they were going to nationalize them, so the only banks that took capital were those that were about to fail or failed. And, you know, their system was undercapitalized for a long time, and I think we reaped the benefits. But our programs are unpopular. What we did was objectionable to us and, you know, objectionable to the Americans, but it was the best of the alternatives we were looking at. BERNANKE: Yeah, sure. So there’s no doubt that a financial crisis is going to worsen populism. We saw it in the ’30s. You know, there’s evidence for that. And on top of that we had a deep recession; many people suffered foreclosures. So please don’t, you know, think in any way that I’m denying that that was a factor. That being said, I think that some of the recent commentary which says this all—all we’re seeing in the political world today traces back to the crisis, I think that’s way overstated. Take the United States in particular. You know, going back to the 1970s/early ’80s, people have been telling pollsters that, you know, by margins of three to one that the country’s, quote, “going in the wrong direction.” There’s been a lot of concern about inequality, a lack of social mobility. And I think that the underlying theme there has been mostly a reaction and resistance to globalization. So if you—you know, what does Donald Trump talk about on the—he doesn’t talk about shutting down banks or—he talks about doing a number on Dodd-Frank so banks can be more—you know, can make more profits. What he talks about instead is immigration, trade. Those—I think the connection there is also tenuous, but I think where a lot of people are—particularly those who have cultural concerns are saying, you know, globalization has not paid off and we’ve not seen—particularly at the middle of the income distribution, we’ve not seen the benefits over the last three or four decades. I think that is the most important factor. But, you know, again, I don’t want to deny that the crisis didn’t help. And certainly the fact that a lot of people either lost their homes or lost their jobs, obviously, that’s going to make people less satisfied. And, you know, again, the things that Hank was talking about, the fact that we chose to sort of try to keep the system alive rather than let it die and then resuscitate it, that put constraints on how we responded. And, no doubt, that also affected attitudes. PORAT: And, obviously, all of this was happening in a very short runup to elections. So Hank passed the baton to you, Tim, on Fannie/Freddie. Sticking with this theme of populism, in retrospect, do you think more could have been done for homeowners? How do you think policies potentially should have been addressed differently, if at all? GEITHNER: I mean, just to be honest about this, things we tried to do on the housing front to reduce the—reduce the scale of foreclosures were late and slow, and they were just not large enough to mitigate a lot of the damage. They were effective in slowing the rate of growth in foreclosures, in capping them. And, you know, we did help millions of people stay in their homes and refinance at lower rates. And those actions were—they were helpful. They added to the power of what conservatorship did to keep the mortgage market functioning, and what the Fed did to keep mortgage markets—mortgage rates low. And that helped put a floor under house prices and was a critical factor in limiting even worse recession. But the modification programs were—you know, they were late and slow; and lots of reasons for that. I would say one of the—probably the principal one was that we felt we had to work through the existing servicing infrastructure, which was—you know, which was terribly inadequate. And there were some pretty bad incentives in the complexity of the mortgage securitization market that it made it hard, too, to modify when it obviously was sensible. And we—you know, the things we did that were very—that worked in the end were very—reached a lot of people. You know, just to be honest, they just came—they came late. Learning was slow. And that was damaging. It’s not quite fair to say, although it is the popular perception, that the scale of the things we did for the financial system were larger, economically more meaningful than what we did for the average person. Just in terms of even simple math, of course, it’s not just that the financial programs earned a very substantial positive direct financial return to the taxpayer, and the people thought we would lose trillions of dollars on that and they earned a very substantial positive return. But, you know, the scale of the tax cuts, direct transfers, benefits that went through the broader fiscal programs/housing programs, were much larger in dollars spent, ultimately, in that context. But, you know, that gets lost. That got very much lost under sand in the debate where, you know, to break a panic, to prevent the risk of another great depression, we had to keep the system functioning. You know, we just didn’t have the option. You know, panics are different from other financial crises. You don’t have the option in a panic of deciding you’re going to save depositors and not banks and bankers, no plausible strategy that rests on that, you know, typical strategy in a crisis. And I’m not sure it is possible to reconcile the fundamental tension between what’s necessary to break a panic or save a country from a panic and what is politically attractive, feasible, in the moment. And I think one reason why financial crises are so terrible is most countries try to get the politics right before they try to get the strategy right. And that usually leads people to be way late, behind the curve, too worried about moral hazard and fairness things, and they let the system burn. And that’s why you get massive unemployment in recessions, depressions, after most financial crises. PORAT: Yeah, I’ve often quoted Hank, who, I remember, in the depths of the crisis, said you have to have the will and the means, and too often, by the time you have the will, you no longer have the means. And we just keep reliving that over and over again. When you think about some of the hard lessons, each of you has said one of the toughest was communication. And that’s one of your biggest regrets, that it was just so hard to make clear to the American public how absolutely imperative this was and the limited choice set and how you were looking to really protect Americans across the country. What would you advise whoever is in your seats when that next crisis comes to do differently, to be able to better communicate, land those messages? Do you want to start, Hank? PAULSON: That’s a hard one, because I was really tough on myself after leaving. I said I should have communicated better. And with hindsight, I look at it and I say, wait a minute, you know, we couldn’t break the back of this panic without going to the source, which was Wall Street. So we had the right policy choice, number one. Number two, we all erred on the side of stability; you know, overtelling the public what they wanted to hear. But if we talked about how dire the situation was and our lack of authorities, you know, it would have been easier to have people understand why what we did wasn’t so—as unfair as it looked, right. But we didn’t want to spook the markets. And then, lastly, at the end of the day, I look at it and say, wait a minute, you know, how do you sell these really objectionable, terrible things we did and sell them because they were better than the alternative and they were necessary? And so what the public sees is the hardship that resulted from the crisis. They don’t see the disaster that might have happened. So you’re never going to get credit for that. So I look at it now and I say wait a minute, you know, anybody that’s heard me read a public speech knows that’s sort of a painful thing and I’m not a great orator. I happen to think I did pretty well one-on-one in negotiating with Congress and so on in that kind of communication. But Barack Obama is, you know, and I don’t think he sold it really well either. I think it’s—I think it’s—I think it’s that’s hard medicine to sell. PORAT: Tim, do you want to add to that? PORAT: All right. So regrets analysis, what else, other than communication, if you could turn back the clock—and the benefit of this ten-year tour is advising that next generation whenever they may come. What else would you look at and say I wish I had either not done it or done something differently? Why don’t we go to the last one? 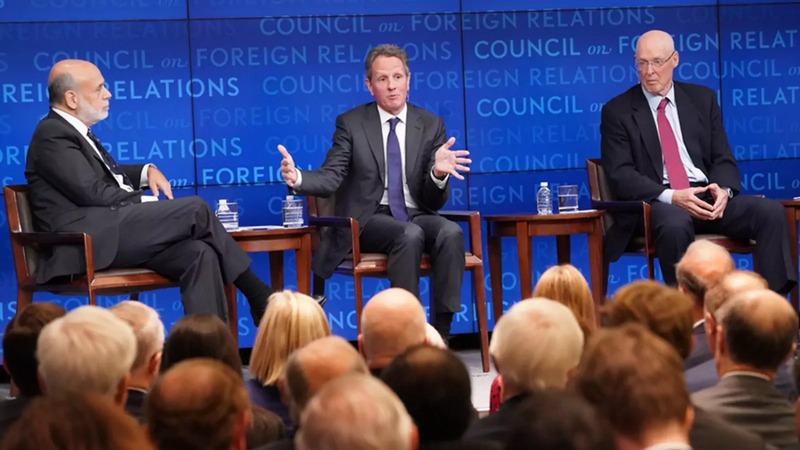 GEITHNER: I’ll do three big mistakes. The first is we let the financial system way outgrow its protections. It took decades, but, you know, on the eve of the crisis, the banks were, like, less than forty percent of the relevant part of the financial system, the rest was operated outside the protections we put in place in the Great Depression. That took a long time to happen, risk migrated outside the system, but that created a very fragile, fragile system, very dangerous system, a system much harder to stabilize than a typical bank-dominated system. Second is we went into the crisis with very weak—very weak emergency tools for dealing with a panic. You know, Hank had to go to Congress twice to get authority that was existentially important. But, you know, typically you’re not going to find the political will to do that until the thing is way past the point of no return, so damaging that people can really feel it. At that point, it’s going to be hard to avoid the, you know, avoid the damage. And I would say more generally, after the initial wave of policy, force, and fiscal stimulus and all the monetary policy drama from the Fed, the U.S. lost the will to sustain the fiscal support for a weak economy too early. And we made the classic mistake of putting the brakes on a little early than would have—would have been ideal. So those are three, but those capture a lot of—a lot of other things. PORAT: Well, hold on there for one second. BERNANKE: Of what happened ten years ago? PORAT: No, sitting there today with the same level of visibility. PORAT: So are the tools better, is the data better? BERNANKE: Yeah. Oh, yeah, sure, it is better. It’s better. I mean, Nellie Liang, who was just nominated by the president to be on the board—when I was there, I made her the first director of a whole new division at the Fed called Division of Financial Stability which does enormous amounts of monitoring and analysis, things that just didn’t happen, you know, before that. So we’ve got a lot more visibility, a lot more effort, a lot more resources put into the systemic stuff. But, I mean, another thing we learned was, though, that you can never be sure, right? So you need to also make sure the system is strong. And I’m sure we’ll talk about that. But let me just say also on the communication—I didn’t say anything about that—I just, you know, I go back and forth on that myself. I mean, I tried to do some things on communication. I went on 60 Minutes a couple of times and I did my best there. And so sometimes I feel like I should have done more, and I’m sure that at the time I didn’t fully appreciate, you know, how much reaction there was going to be. On the other hand, you look around the world, and can you point to a country where this problem was solved? It’s not obvious that, you know, that anybody has really figured out how to communicate this type of thing. And it’s unfortunately—it is, by the way, I think, a good reason to try to have the tools and the structure in place in advance and talk through in advance rather than have to do it, you know, on the fly. GEITHNER: Can I just say one thing on this, Ruth? GEITHNER: You know, we all—we all say this. But you know, I think it’s good to go back and just remember, you know, we didn’t have good answers for what we were going to do next, what was going to be necessary, because, you know, we were feeling our way. And although it’s easy to say now that, you know, if we had had the time to go out and give a daily press conference so that people had a better feel for the choices we were making, that would have been reassuring, confidence-inspiring, would have broadened the political base for it. I don’t know. I mean, I’m not—I’m not sure. I don’t—I just remember what I really felt at that moment. And apart from being consumed by trying to figure out what next, what might work, what could we do, it’s just important to remember how much uncertainty surrounded really everything. And that—that was—that lasted for six months. It wasn’t, like, a fleeting thing. Maybe nine months. PAULSON: Yeah. And, Tim, to add to that, just to put an exclamation point on it, we did not have the authorities we needed. We knew we didn’t have them. We had actually consulted with Barney Frank and with others. We knew we couldn’t get them unless—and so we were doing things with duct tape and bailing wire. I mean, we were being—improvising with the authorities we had until the luck finally ran out. And so that’s—I think that’s part of the issue. PORAT: For me, that was one of the most profound things, watching you constantly innovating, turning. If something didn’t work, you didn’t stop; you tried something else. And in the most—in that most recent New York Times editorial that the three of you wrote, you made the comment that Congress has taken away some of the tools that were so critical to you during the 2008 panic and it’s time to bring them back. So if you could actually execute on that, what are in particular the most important tools that were taken away that you think we all need to give back to those who are in your seats? PAULSON: Well, so I want to also emphasize we have some tools and the system is in better shape. But as I look at it, I say one of the scariest moments for me was when the money market funds began to implode and when we heard from five or six of the big complexes that they were being hit with withdrawals. At the same time, I’m hearing from major triple-A industrial companies, could not sell their commercial paper, and—which they rely on for short-term funding. So I’m looking at it and saying, wow, you know, if they have to start cutting back and not paying their suppliers, this is going to move very quickly from Wall Street to Main Street because it’ll move very quickly to the smaller companies, who will be laying off workers. And so what did we do? We used the Exchange Stabilization Fund at Treasury to guarantee the money markets. Well, when Congress gave us, you know, the TARP, they also wrote in the law never again use the Exchange Stabilization Fund, OK? So those that come after us won’t have that again. I think one of the most powerful things that gets less attention that was done was the FDIC using a very broad, expansive interpretation, you know, the—of their authority to guarantee the liabilities of the bank holding companies and banks to issue new debt. That was very, very powerful and did a lot to help us break the back of this thing. Well, Dodd-Frank, Congress took that away. So those are—those are two. I think that Ben and Tim have explained how the Fed used their emergency lending powers twice to avert disaster, first with Bear Stearns—which I think we dodged a huge bullet, because if they’d gone down before we had stabilized Fannie or Freddie, Lehman would have gone down, I think, almost immediately; it would have been a disaster—and used the emergency lending for AIG. Now that’s been taken away on an individual-company basis. You can do it on a systemic basis. Now, we do have the orderly liquidation authorities to wind down a failing nonbank. We wish we had had that with Lehman. And, you know, I think that works during normal market conditions, and let’s hope it works during a panic. I’m not sure it will work the way Congress intends it to work during a panic because one of the things we learned is to break the back of a panic it takes fiscal authorities. It takes government money. And, of course, the intent of that is not to use government money. But maybe it could be used in a very creative way in the middle of a panic. PORAT: This is a critical question. I’d love to hear Ben, or Tim—would you add to that list? What else would you think is needed to stabilize if we find ourselves in a panic? BERNANKE: Well, from the Fed’s perspective, what the Fed does as lender of last resort is provide liquidity against collateral to firms that are illiquid but presumably still solvent. And there are two authorities: a discount window that goes to banks; there’s 13(3) which is used on an emergency basis for nonbanks. Both were damaged by the subsequent legislation. There are disclosure requirements now on the discount window, which make it more stigmatized and less useful, and restrictions put on 13(3). So if you’re asking me what my ideal world would be, it would be a world similar to most other countries, like Europe in particular, where any financial institution that takes short-term runnable deposits—whether its commercial paper, or repos, or whatever it is—and uses that to finance credit should be subject both to, you know, sort of bank-like supervision and have access to Fed lending. I think that broad extension would make a lot of sense and would get rid of this artificial distinction between banks and nonbanks, which was actually one of the key elements in the crisis. PORAT: OK, let’s talk a bit about leadership decision making in a crisis. Tim, let’s start with you. What do you believe are the most important principles that should be followed when in a crisis, both for those in government and also we have many corporate leaders here as well. What do you do in a crisis? GEITHNER: Well, I think in a financial crisis you have to recognize, you know, there’s just huge uncertainty about the outcomes, and you know, you’re going to make one of two mistakes. Either you’re going to be late, and slow, and do too little, or you’re going to take the risk of doing too much—overdoing it. And in a crisis you have to have the—you know, you don’t really know what is the line, the margin between something that is going to get resolved with little trauma but without the risk of a panic and what tips over into panic, and you have to have the flexibility to, you know, escalate very quickly. That’s one reason why it’s so important to have more discretion available to the Treasury and the Fed to take risks the markets can’t take in a panic because, without that authority, you won’t be able to act quickly enough to break a panic. So I think the—you know, people talk about this lots of different ways. They talk about it as a risk-management framework for thinking about policy. You have to think about the—you know, the range of probabilities and what’s the cost and the damage that might be caused by something you think is remote, unlikely, but still could—is possible. And in a crisis you have to give a lot of weight to that worst-case outcome and try to err on the side of doing as much as early as you can to reduce the probability of that outcome. That’s a simple framework. But I think, you know, the most important thing is the people around you who trust each other enough to debate things and disagree, and to try to work through the options, and one of the great benefits that we had, apart from having, you know, two presidents from different parties over a dangerous transition willing to, you know, basically put country over party and short-term political interests, was that, you know, we had a lot of trust in each other, and enough trust that you could—we could disagree and we could—we could challenge each other and keep pushing it to figure out, OK, if not that, would this work. And if not that, then what might work? PORAT: A really important line there: put country over party. And, Hank, I want to turn back to you. Twice you got Congress to give Treasury unprecedented emergency powers: first Fannie/Freddie, then in TARP. And it’s probably the last time we’ve seen something—that coming together of both parties to do something that was so controversial and yet so critical. In the polarized world we have today, do you think you could get it done, or what would you advise whoever is in your seats to be able to have that kind of outcome as you did back then? PAULSON: Well, there’s a lot in that, but as Tim said, we had—we were backed by really strong leaders, and when I came to Washington it was a poisonous atmosphere. I mean, 40 percent in approval rating would look pretty good. I mean, President Bush was in the high 20s then. But he encouraged me to work with Democrats and Republicans, and we had a year before the crisis hit. The three of us got to know each other, work with each other. I had a chance to develop a relationship of trust with the president, which is essential. I had an opportunity to actually get things done with members of Congress—you know, work with Democrats and Republicans on trade deals, stimulus deals, et cetera. And so there was a lot going on, and the fact that there was divided government made a difference because the Democrats felt a really strong, you know, responsibility to govern. And a crisis brings out, you know—we saw, as I said—we saw the worst before the crisis, but you know, at the end it brought out the best. So I’m not—there’s a lot of dysfunction in Washington right now. I’m not denying it. And this country’s terribly divided. So it’s—but I don’t want to ever say and bet against the United States of America and say that in a crisis we couldn’t come together and do what was necessary because the crisis brought people together quickly, and ultimately we saw the very best in our government. And I’m certainly never going to say that’s—no matter how bad things look in Washington, that we couldn’t do what was necessary. PORAT: I’m going to open it up to members for questions, but I’m going to do a one-word answer from each of you because crises do have a horrible way of repeating themselves. What one risk are you most worried about out there that could be the catalyst for the next one? Ben, we’re going to start with you, and then we’ll be opening it up to the members here. BERNANKE: Well, I’m worried about the deterioration—this is the foreign relations center—I’m worried about the deteriorations in international frameworks and institutions. That means next time—I mean, we didn’t talk at all about foreign cooperation, but we had enormous amounts of cooperation with other countries and it was very helpful. GEITHNER: Yeah, I would say politics. If you want one word, politics. PAULSON: I’d have to say the same. PORAT: OK. On that note we’re going to open it up to members. I just need to remind everyone this is on the record. Please wait for the microphone and speak directly into it. Stand and state your name, your affiliation, and please limit yourself to just one question. And we have one right up in the front here and then we’ll go to the back. Q: Thank you. Thank you. Mark Angelson, vice chairman, Joe Biden Foundation, speaking for myself, not for anybody else. PAULSON: Well, so they—first of all, all were essential. And, you know, that—to me, the way the three of us worked together, the way our skillsets complemented each other. You know, Tim—it wasn’t just that Tim had been president of the New York—was president of the New York Fed—that’s important—but he had started as a career employee and worked his way up to be undersecretary of treasury. That’s just phenomenal at a—at a young age. And had been through two financial crises at Treasury. So, I mean, he helped advise me all the way along in terms of where the levers were at Treasury. The fact that the continuity that went when he then became the treasury secretary for President Obama. And then, of course, Ben just, you know—you know, what can I say in terms of the courage that he had and, you know, the fact that he had actually done his academic work on the Great Depression? So none of the three of us—you know, as Tim said, we debated. We discussed all sorts of things, but we never debated whether we should take the risk of having a systemically important institution go down because we all knew that that was—that that was something that we—that just was something that—a risk that we weren’t going to take. GEITHNER: —it was only when, on Columbus Day weekend, you used the TARP to put capital into most of the banking system, and the FDIC agreed to guarantee the ability of bank-holding companies to issue new debt, that you first saw a meaningful break in the panic. And even that eroded too over the following three months. So it’s not—you weren’t implying this—it’s not quite right to look back at that period of time and say those capital injections by Warren Buffett and by the Japanese bank into Goldman and Morgan Stanley themselves or their bank-holding companies did more than buy a little bit of time. And that’s not to take anything away from those institutions and their management then. PAULSON: Yeah, I agree with that. And with Morgan Stanley, you know, I still had to write a letter to the Japanese, you know, finance minister to keep Morgan Stanley from—to keep Mitsubishi from backing away from their capital commitment. So again, we were really on the brink. And we were at a point where, if either one of those institutions had gone down, I don’t think the system could have taken it. I think we would have had just a massive meltdown. PORAT: We’ll take a question right up here in the front. Actually I had a foreign-relations dimension. The G-20 had its big debut within a few weeks of the meltdown and panic. And it was seen in—I think it was March of 2009—as having successfully coordinated some global response. What concretely was contributed by partners, both the traditional G-7 developed countries and the new emerging countries that were added in with the G-20, in terms of reflating the global economy? And what were they asking of the Obama administration to do that it wasn’t already doing? GEITHNER: Well, the—I think the right way to think about the international cooperation was, you know, the Fed supplied dollars freely to the world central banks on a massive scale and lent directly to the European financial system on a very large scale. That was very important. Ben helped coordinate a(n) interest-rate—global coordinated interest-rate cut by the major economies in October-ish of ’08, which was a very important signal. Hank and President Bush convened the first meeting of G-20 leaders to send a cooperative signal about commitment to prevent the collapse of the global financial system. But then in March, early April, we helped orchestrate, you know, another power signal—powerful signal of coordinated fiscal or cooperative fiscal response, continued cooperation among central banks, and provided a huge dose of additional resources to the IMF and the World Bank so they could lend to the emerging economies that were, you know, very much caught up in the crisis. So it was the strength of that signal that added to the steps that we had taken as a country that helped start to turn sentiment. BERNANKE: The G-7—let me just add to that. There was an incredibly important meeting of the G-7 in October of 2008 after Lehman, when we coordinated among ourselves in terms of the kinds of actions we were to take with respect to our own banking systems, and also made a joint commitment that we would avoid any further failures of systemic firms. So the G-7, I think, was dominant during that period. The G-20—you know, it takes—it was a break-in period where people got to know each other. And so it took a while before the G-20 took the leadership role. But over the next few years it did. PORAT: Right up here; this woman right in front. Q: Thank you. Hi, Nili Gilbert from Matarin Capital. As you took the extraordinary steps that you had to to stave off the worst of the financial crisis, there were many naysayers who worried about the potential for hyperinflation or a much weaker dollar as the Fed balance sheet expanded greatly, or for a fiscal crisis, as the deficit expanded and the potential for a loss of faith in U.S. credit quality; that if we had higher interest rates at that time, it would have been a disaster. How much did you worry about the potential for those negative outcomes? And what do you think those naysayers got wrong? BERNANKE: Well, we were quite confident that hyperinflation and all those things were not in the cards. We understood that the economics of a liquidity trap, where interest rates are close to zero, are quite different from sort of, you know, wartime situations when you get the hyperinflation. So we were not concerned about that. We weren’t concerned about the dollar. There were a lot of other concerns, I think, that were more minor that we tried to pay attention to. We tried to go—I mean, we were often accused of being reckless. We tried to be as cautious as we could, consistent with achieving what we needed for the economy. But also, you know, in retrospect, we had a conference last week and the commentary on the monetary policy was it went too slowly and because they were being too cautious about, you know, things they didn’t understand. So we went—we went cautiously, but we were pretty confident that those risks of QE and so on were not really there. And I would—the media people here, you know, I don’t think the media did a very good job. They give a lot of credence to people who were not really qualified to comment on these issues, but who were making these kinds of claims. And it hurt us, we got political pushback, we got a letter from Congress saying don’t do QE2 because it’s going to cause hyperinflation. So it was a problem for us, but we—obviously, the Fed is independent, we did what we thought was necessary. GEITHNER: On the fiscal side, quickly, we thought it was essential to have a very substantial dose of fiscal stimulus given the collapse and private demand at that point. And, you know, with the financial engine broken down, monetary policy could not carry the sole burden of reducing the severity of the recession. We thought that was very important and, you know, ultimately got several rounds of substantial stimulus, not enough to offset the collapse and private demand, but it was very important to it. We did make the judgment that that should be, although sustained for as long as possible, should be temporary and that we should work to get the deficit down to a sustainable level over a five-year period of time, which we ultimately did, although, as I said earlier, it happened a little too fast for comfort. We did that because we thought that the credibility of our capacity to provide a sustaining support for the economy depended on the world believing we would bring our deficit back down to a more moderate level within a reasonable timeframe. So we were—we were not worried we were going to become Greece. We thought there was no alternative, but a substantial temporary increase in borrowing, but we didn’t think it was something you could justify doing indefinitely, and had to show some measure of political will to get ourselves back to a deficit that would stabilize the debt burden at a—at a—at a relatively acceptable level. PORAT: The gentleman right up here in the middle. Q: Angelo Lisboa, JPMorgan Chase. Secretary Paulson mentioned the importance of healthy banks accepting and participating in TARP to avoid the stigma, right, and heightening the panic. Do you worry next time healthy banks will refuse government support and stay away from shotgun weddings? PAULSON: The simple answer is yes, I do, because what happened, it was—it was fascinating and it was demoralizing to watch. Because we had structured these equity infusions, they were going to be preferreds rather than common, nonvoting, we agreed that everyone was going to take the capital, but it didn’t take long for the press and the public to start talking about these being nationalizations and then the stigma to set in. And there was a stigma. And, you know, and you’re from JPMorgan Chase. I would say Bear Stearns—when you look at JPMorgan bought Bear Stearns and WAMU. And I think both of those acquisitions helped the country a great deal. JPMorgan made those acquisitions also because they thought they were in their best interest. But I don’t think that they or Jamie Dimon expected to see the kinds of repercussions he saw. So, yeah, I think it will be harder during the next crisis to have policymakers do some of the things we did because they were so unpopular. It will be harder to have Congress vote for something like that again. It will be harder to get banks to take capital again. It will be harder to get banks to step up, the healthy banks, and make a risky acquisition in the middle of a crisis again. So all of that will be more difficult. PORAT: On that note, the last question goes to the woman a couple of rows back behind our last questioner, right here. Yeah. Q: Good morning. Kathryn Harrison from IBM. I wanted to ask, one of the key innovations that came out of the financial crisis has often been called bitcoin and the rise of cryptocurrencies. Proponents of cryptocurrencies really focus on the benefits of decentralization and the ability to simply fork a network if a problem comes up. Given what all of you have lived through and described, decentralization would certainly not have been a strength. What advice would you have for those organizations who are in the process of building the new emerging economic models around governance and managing the crises that will inevitably come? BERNANKE: I think there’s a lot of silliness around cryptocurrencies, a lot of bubbles, a lot of people who don’t understand what they’re about. So I would put that aside and just say, though, that there are a lot of interesting technological developments having to do with decentralized trading and so on, which are potentially quite interesting. And I actually—you know, thinking about the medium term, one of the big challenges to the financial system is going to be technological innovation because you’re going to see all different ways in which banks are going to get this intermediated in various ways. They won’t be able to do their normal functions because there will be technological substitutes or specialty firms that, you know, do some of these different things. And so the question of how the regulatory system and how the Fed and so on will adapt to that is actually quite interesting. So the short answer, not a big fan of cryptocurrencies, but I think there’s some interesting technological developments. And we’re probably going to see some massive changes in the financial system over the next ten or twenty years. PORAT: And on that note, a sacrosanct tradition, as many of you know, is that we finish on time. OK, Dr. Haass here—so we are on time.